I really enjoyed both of these movies and I think Hitchcock is a genius behind the camera. He uses themes and motifs brilliantly in both films. I like how in both of the movies he uses shadows. 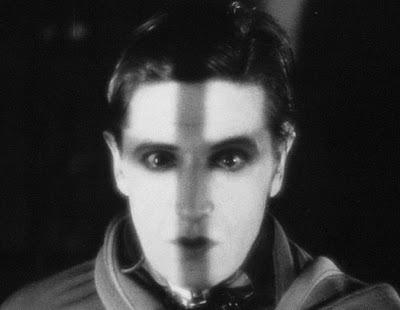 In The Lodger he casts a shadow that looks like a cross to convey a Christ-like figure and in Blackmail he casts a shadow that looks like a mustache to convey a criminal. We also realize that there seems to be a love triangle in both movies. As we will see in Hitchcock films, men are very controlling of women and will not let them have a say in most situations. Hitchcock films The Lodger in an interesting way since he does not have sound available. When the scene is outside there is a blue tint in the reel and inside it is a normal black and white tint. In Blackmail Hitchcock has the use of sound but he does tease us at the beginning with not putting sound in on purpose. In Blackmail there are many themes and motifs to be talked about, such as the paintings, laughter, control and so on. In The Lodger Daisy has two men to choose between and they both love her. In Blackmail Alice is not satisfied with Frank so she wants a new romance with the artist. The artist, Crewe does not love her and only wants her for one thing. I think both of these movies are very similar. They are both thrillers, have love triangles, shadows, black and white, and so on. I think these films differ because one is sound and the other is not. Hitchcock uses sound creatively when he makes the word “knife” the only word heard in the scene in Blackmail. This entry was posted in Silent to Sound and tagged silent, sound, to on September 16, 2014 by Marion Butler.